Garden Party - Le Blog de Thierry Cattant: Wang Guiying, a 107-year-old Chinese pearl! Wang Guiying, a 107-year-old Chinese pearl! I love these cartoon style! Elle a bonne mine la mamie ! Really really! Nice jobs have here!! Fabulous color and great style draw! i gonna visit this blog more time! Great characters Thierry, I really like your pin ups. She is a beauty! 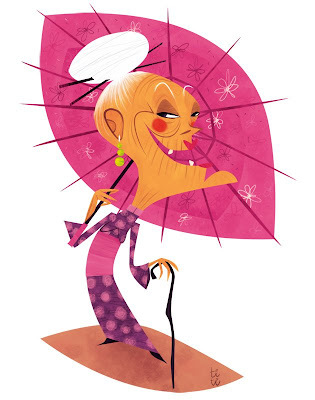 I love your work-- great characters, colors and textures. So happy to have found your blog. This is awesome. She has so much character. Perfect work! Many thanks to everyboby for your comments!! !